The thrill of the Christmas holidays had vanished and Peter and his sister Janet decide to restart The Secret Seven. This essentially being a group of seven members who each wore a badge with S.S. and had to remember a quite often quirky password. 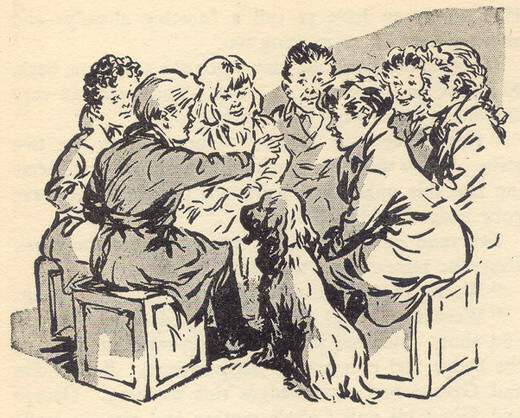 The five other children in the S.S. are Jack, Colin, George, Pam and Barbara. There is also a dog called Scamper, who belongs to Peter and Janet. In this book, the first of 15 in the series, the children arrange an S.S. meeting in the shed in Peter and Janet’s back garden. The shed is next to the greenhouse boiler, giving it a warm feel. It contains five boxes and two flowerpots, with sacks as rugs and a shelf where biscuits and blackcurrant tea, a mix of blackcurrant jam, sugar and boiling water sit. During the S.S meeting, The Secret Seven agree that its members should actively search for a mystery or a good deed. The Seven then decide to build snowmen in a field. After doing this, The Seven come across a big empty house with an angry, deaf caretaker. It is after this encounter Jack realises he has lost his S.S. badge and may have left it in the field. Jack can only look for it at night as he was punished for accidentally kicking Miss Elly, his annoying sister’s nanny. When Jack eventually sets off down the lane to the field and the empty house, he quickly finds his S.S. badge, but is soon given the shock of his life. A car pulls up near the gate and two mysterious men get out even though the lane leads to nothing and it is late at night. This was strange enough, but Jack then heard the sound of squealing and thudding in a mysterious van like carriage on the back of the car. In understandable horror, Jack runs back home and leaves a letter for Peter and Janet calling for an urgent S.S. meeting. The Seven are all astonished by Jack’s adventure and decide to look further into the lively events of the previous night. Peter makes the orders, and it is agreed that himself, Colin and Jack would go down to the house to ask the caretaker if he had heard anything in the night, whilst Pam and George have to enquire about the owner of the big empty house. As for Janet and Barbara, they are given the task of following the tracks from the car and mysterious carriage. The Seven are successful with all their tasks. Janet and Barbara find out that the tracks went exactly where Jack had been, whilst George and Pam find out that Mr J. Hollikoff lived in the big empty house. The three boys make the most exciting findings when they discover that the old caretaker had even heard the same squealing and thudding noise in the night. Due to this revelation, the Seven come to the conclusion that the two men in the car and mysterious carriage went to the house and hid a prisoner. To see if their suspicions were true, they decide to dress up as snowmen on the field. Peter decides that only the four boys can go, with two staying with the snowmen the children had built in the field, and the other two boys going up to the house to find the prisoner. 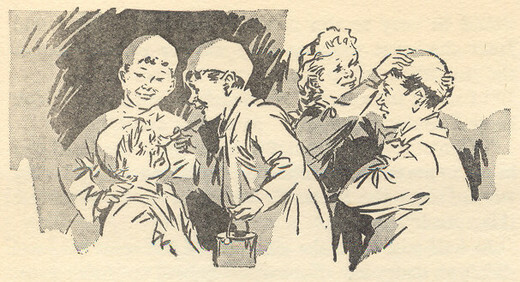 In their white overcoats, white skull caps and white face paint, Peter, Jack, Colin and George go to the field in the middle of the night. The real excitement starts when Peter and Jack, the two that go off to the empty house, hear the same squealing and thudding noise, which the follow down to the cellar. Before they have a chance to look the two men come back and in their anger lock the boys in the cellar. It is here that they are given an enormous shock as they come face to face with the prisoner. Appalled they cry for help and luckily Colin and George eventually come and rescue them. The next morning the Seven phone the police and the two men are arrested. As a reward the children are given circus and pantomime tickets in a happy ending to the adventure! In my view, the first book of Blyton’s Secret Seven series turns into a fairly strong mystery and story. It is clever how Blyton manages to disguise the identity of the prisoner. Not many readers would be able to figure it out, and I certainly got a surprise when it was revealed. Looking back, there were clues to this, such as the thudding noise, the footprints in the snow, and the carriage, but it is easy to say that once you have read the book. My criticisms would be that it takes a while to get into the book. The sense of unpredictability and excitement does not really start until Peter, Jack, Colin and George dress up as snowmen. Even then, I find it a bit hard to believe that the four boys could really look like snowmen. The plot was a little far-fetched and followed a Find-Outer type theme. By this, I mean it was a case of identifying a mystery, finding clues and splitting up in pairs. And of course, the four boys in the Seven get to take part in the dangerous aspect of the adventure in the big empty house. The book is very systematic and follows the typical codes and conventions you would expect from a mystery series. Personally, I find this harder to warm to than the Famous Five. In the Famous Five, the children do not seek to find a mystery. Instead, they enjoy seemingly innocent trips into the beautiful countryside, only to eventually find a mystery. I think the location and sense of innocence makes for a far more effective story. The Famous Five Series is really is unique in this sense. The characters in Secret Seven are not as strong either as the Famous Five. In the Famous Five, they are all individuals, and the reader is given a strong insight into their personalities and relationships, whereas little is mentioned about the characters in this first book of the Secret Seven series. Peter is a poor version of Julian, to the point that he gets rude about the passwords and badges, and even shouts at the deaf old man. Jack is probably the strongest character, playing a huge part in discovering the mystery in the first place, and coming up with further bold ideas and a lot of bravery when he was in the house with Peter, who was also brave in this instance. But apart from this, there is not much, even Scamper is not the same as the loveable, courageous Timmy. 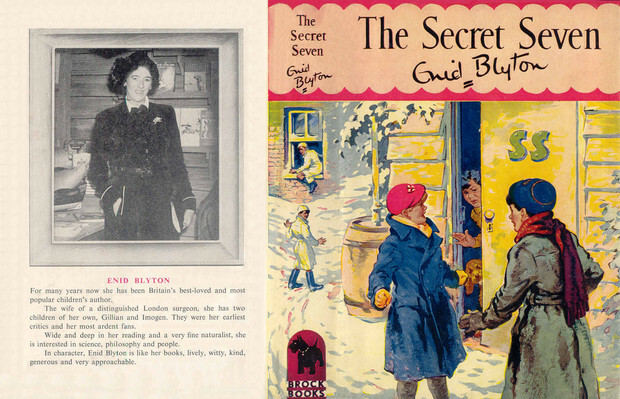 As a book, The Secret Seven was a good first mystery, but it is not a patch on Famous Five. This entry was posted in Book reviews and tagged The Secret Seven, Written by Ben. Bookmark the permalink. What a good review! I enjoyed reading through it.I wish I could write a review as concisely and cogently as that,but all that keeps coming out is ‘abbledy abbledy’,sigh!